The GDPR, the General Data Protection Regulation, has been in operation since May 2017 and is enforceable from 25th May 2018.
iii) Emails to the distribution list will be sent using “bcc” to prevent your email being shared. a) Be removed from the list etc; but this will affect your ability to learn of activities at ECCH. b) See what information we store about you, by request to the DPO, and we will provide this within one month. 5) The data will not be shared with others. 6) We will retain the information until you request its deletion or for a period of 3 months after ECCH ceases to be used for events. Please note this form is no longer active after March 31, 2018 (for technical reasons beyond our control). 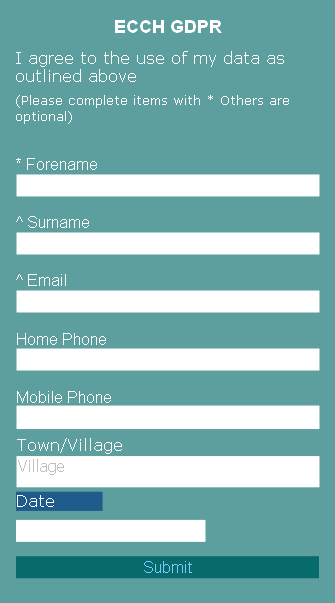 Please then include your forename and surname and any other information shown on the form.